At the time of Doomsday Book, the manor of Fawley was held by Walter Gifford, the Earl of Buckingham. Later, in the 1100s, the Sackville family built a fortified manor house on the site of the present Fawley Court and lived there until the late 1400s. In 1616, Fawley Manor, which at that time was probably a large medieval house, was purchased by Sir James Whitelock. He was a lawyer who was Commissioner of the Peace for Buckinghamshire and later for Oxfordshire as well but, despite these appointments, he favoured some curtailment of royalty`s freedom of action. He was highly respected in Henley and on several occasions the Corporation presented him with gifts such as haunches of venison. After his death in 1632 and burial in Fawley church, King Charles I referred to him as “a stout wise and learned judge”. His son, Sir Bulstrode Whitelock, inherited Fawley Court and Manor, and he also bought Phyllis Court and the title of the lord of the manor of Henley. At the time of the Civil War, Sir Bulstrode supported the Parliamentarian cause and fought in the army under Cromwell. However, Fawley Court was severely damaged by Royalist troops, who occupied it for a time. Subsequently, Sir Bulstrode Whitelock became Governor of Henley and was appointed by Cromwell to various posts which included being ambassador to Sweden. After the restoration of Charles II, he was heavily fined for his part in the Civil War, though it is possible that this was, at least partly, revoked. Sir Bulstrode retired to his house in Wiltshire and passed the ownership of the damaged Fawley Court to his eldest son James, but no repairs were carried out and in 1680 it was sold to a Colonel William Freeman. Colonel Freeman had a new house (the present one) built in 1684, in a style made fashionable by Christopher Wren, who was a friend of his. Freeman had fought with Bulstrode Whitelock in the Civil War and had since become wealthy, particularly by trading in sugar from his estates, manned by slaves, in the West Indies. His wealth enabled him to have the house rebuild, and to decorate and furnish it to a high standard, as well as improve the appearance of the grounds. Some of the interior decoration was carried out by Grinling Gibbson, and it is possible that “Capability” Brown was involved in the landscaping of the parkland. Around 1770, Sambrooke Freeman, who had inherited the estate, bought the adjacent property of Phyllis Court. 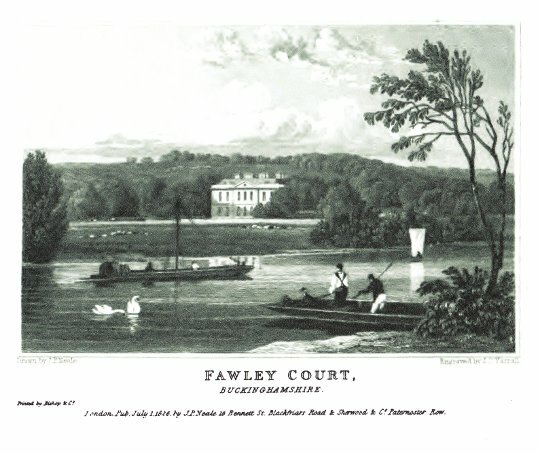 He also commissioned James Wyatt to create an appropriate summer house, and the result was the temple, just visible from Henley Bridge, that gives its name to Temple Island. This project was part of a trend for the owners of country houses to create the appearance of natural landscapes in their estates and then to add “picturesque” and classical features. Sambrook Freeman`s enthusiasm for this style was probably gained during his travels in Italy, and was reinforced by his becoming a member of the Society of Arts. During his time at Fawley Court, it was the venue for many social events, including musical dinners organised by Mrs. Freeman. Both George II and George IV visited the house on several occasions.